Awareness Modules: Align every employee on a common understanding of RACI with the first two modules, a total of 18 minutes. Flexible Curriculum: Navigate the course in any order and learn what you want. Focus on project management, HR applications of RACI, or leading change. 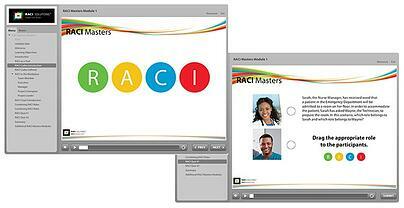 Real-world Applications: Six interactive activities demonstrate how RACI is being applied to real world situations. Resources and Templates: The course includes 15 resources and templates to help you and your employees sustain the learning. Fill out the form on this page to request your free preview now.